The SIGNATURE COLLECTION CUSHION was designed to increase comfort when using the Signature Chaise DEEP out of the water shelf and on a deck or dry surface. Featuring a FULL body cushion and a BUILT IN headrest pillow made of Marine Grade Sunbrella fabrics, they create the ultimate lounge spot for extended relaxation sessions or poolside napping. 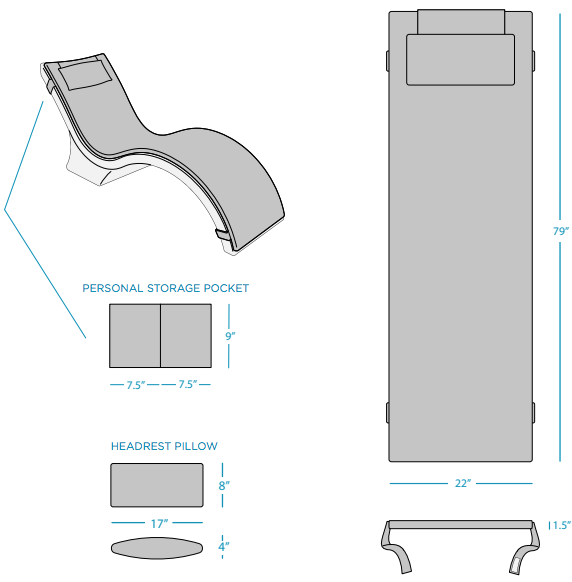 Each is crafted with an EZ-Dri Foam core and comes complete with a small personal storage pocket that hangs on the rear of each chaise. Easy on/off with velcro securing. The Signature Chaise DEEP Cushion is recommended for OUT of water use. The Signature Chaise DEEP is sold separately. The Chaise Cushion and the Chaise Deep Cushion are NOT interchangeable as they each have different measurements so be certain you are ordering the one that fits your chaise. Dimensions: Signature Chaise Deep 22" x 79"